Christmas Love: Ho Ho Ho [C8799] - $7.00 : Yarn Tree, Your wholesale source for cross stitch supplies. 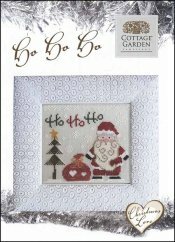 Christmas Love by Cottage Garden Samplings is a series of three Christmas charts that can be stitched as one large design or three individual designs. Santa is standing next to a bag full of Christmas goodies. Stitch count for individual design is 79 w x 71 h. Stitched on 32ct Linen.